The web service created in these exercises is called GetEmployees. The SOAP Agent consuming the GetEmployees web service will pass a department and section to the server. 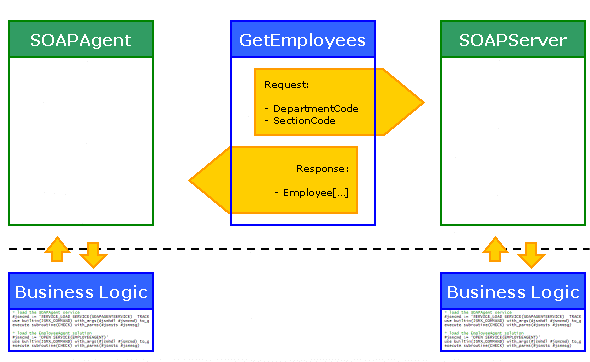 A list of employees for that department and section will be returned by the publisher, the SOAP Server, as an array. If only a department is passed, a list of employees in all sections for that department will be returned. If no department and section is provided, then all employees for the company will be returned. The SOAP Agent program created to test this web service uses Visual LANSA RDMLX, but it could be created using an RPG program equally well. To create the Agent side of a web service called getEmployees. 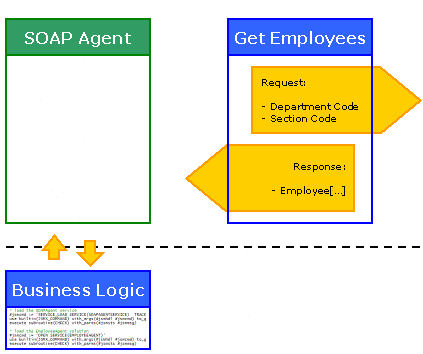 In this case, the web service will be the SOAP Server created in Step 8.Create the SOAP Server Business Logic. To define the SOAP Agent Solution using LANSA Integrator Studio.